A West Midlands NHS Trust has today (10 October) ‘donated’ its homepage to a leading charity in a bid to help end youth homelessness. Sandwell and West Birmingham NHS Trust, has dedicated the space to St Basils to raise awareness around the serious issue. Visitors to the website www.swbh.nhs.uk will see a branded overlay inviting them to visit the charity’s website to find out more and sign up to their newsletter. However, users of the website are still able to access the original homepage. 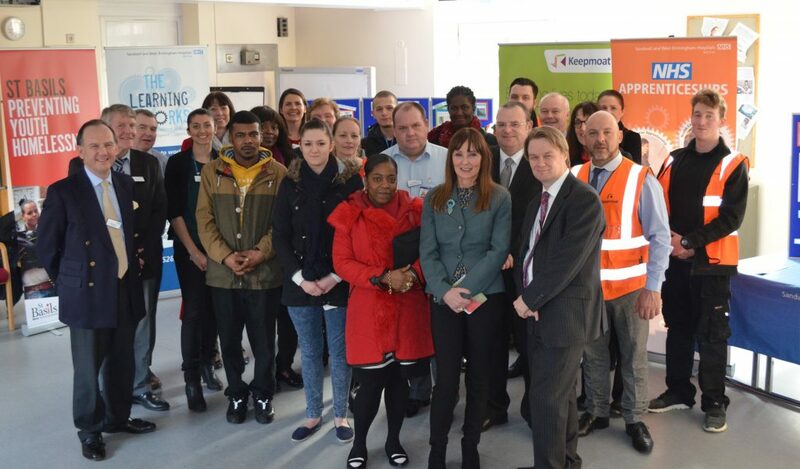 The Trust, which runs Sandwell, City and Rowley Regis Hospitals, has strong ties with the charity, after they jointly piloted the award-winning Live and Work scheme. The initiative, which has been running since 2014, works to provide accommodation and apprenticeship opportunities to young people. In providing accommodation, it has regenerated some of the derelict housing in the area, providing young people who were previously homeless or at risk of homelessness a safe place to live. Bethan Downing Deputy Director, Organisation Development and Learning, said: “We are very proud as an organisation to be supporting the ‘donate your homepage’ initiative by St Basils, with whom we have a strong partnership. “Our Live and Work scheme provides young people with an opportunity to grow, to learn and actively use new skills in the workplace, at the same time as earning an apprenticeship wage which develops the lifelong skill of managing money and living costs. Apprenticeships are offered in a variety of fields, including health and social care, business administration, and healthcare support services. Functional skills lessons in English, ICT, and maths are also delivered. The aim is to teach the young apprentices transferable and universally useful skills in order to see them flourish and advance in their chosen field. Once the scheme has been completed, apprentices will be eligible to apply for permanent, paid work within the Trust. As one of the largest employers in a socially deprived area, the Trust recognised the need to engage with people across the community. Not only does this aid in bringing that sense of community back, it also paves the way to a future for many by creating opportunities and opening doors.